But in a single instant, one phone call turned his life completely upside down. Completely panicked, Jeff dropped everything and raced back home. When he finally arrived, most of his family’s possessions were either in a heap in the front yard or tossed inside the dumpster. And in a single afternoon, the life he’d worked so hard to build for his wife and three daughters was gone! And despite what you’re hearing from the mainstream media about this so-called “economic recovery,” it’s a story we’re going to hear again and again and again in the coming years. Have some people benefited from this record long bull market? The richest Americans who own most of the financial assets have seen their wealth skyrocket. But for hundreds of millions of Americans who don’t belong to the 1%… who were so completely devastated from the last crisis that they were either unable or unwilling to participate in the “recovery”... things HAVEN’T improved. In fact, for many, things have gotten worse. Those are the prosperous parts of America where there’s been strong economic growth, new jobs, rising home values, and higher pay over the past two decades. And no surprise, most of that prosperity is concentrated in the fast-growing western cities and tech hubs… like San Francisco, Seattle, and Austin, TX. Could send millions of Americans spiraling into the same situation as Jeff B., just one phone call away from experiencing the embarrassment and shame of losing their homes. In Fact, the REAL Carnage is Only Just Beginning! And we’re already starting to see the cracks deepening in this fake “housing recovery” all across America as a silent foreclosure crisis continues to gain momentum. In August 2017, five states (and D.C.) saw significant year-over-year increases in foreclosure filings –– Mississippi is up 9%, Vermont is up 12%, Louisiana is up 59%, Washington D.C is up 67%, Wyoming is up 79%, and Alaska up 100%! Nearly a quarter of the nation’s largest metro areas are seeing rising foreclosures… including some of the hottest housing markets in the country like Denver, Austin, Dallas, Nashville, and Columbus, Ohio. 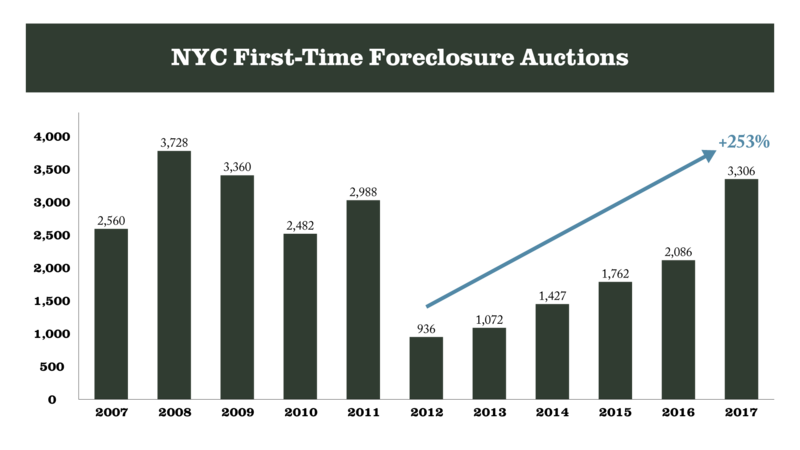 Even New York City is seeing foreclosure auctions explode to levels we haven’t witnessed since 2009! And if it’s getting this bad in the best markets in America… it has the potential to be much, much worse everywhere else. Which is why today is a critical moment for you, your family, and your future way of life. Could Drop By 50% OR MORE! But this isn’t the first time I’ve made a controversial prediction like this… and been right! And to no surprise, the talking heads on TV did their best to either discredit my warning or outright ignore me. Like A.C., who’s been following my work since the 90’s. Here’s a review he left on one of my books at Amazon.com. Ben B., who thanks to my research, was able to get out of the stock market before it came crashing down in 2008. “‘This is the calm before the storm’... Harry Dent was referring to the real estate market in September 2006, as he addressed the Network Advisors at a conference in Tampa. His research suggested that we were in the greatest housing bubble that we have ever experienced, which was about to rapidly deflate. You can take this seriously and have the once-in-a-lifetime opportunity to protect yourself –– and your loved ones –– from the devastating crisis at our doorstep. So, if you –– or someone you know –– are one of the millions of Americans who are counting on selling their home to afford retirement… I urge you to heed this warning. Sell Your House NOW Before It’s Too Late! Because the domino effect caused by this upcoming crash most certainly CAN have a dramatic impact on your wealth if you aren’t prepared. But before I go any further, let me introduce myself. I’m a Harvard MBA graduate, Fortune 100 consultant, and new venture investor who — with the help of the research foundation I created — discovered a powerful link between the science of demographics... and how they directly affect what the markets will do next! Spending –– NOT government policies –– is what drives EVERY economy. You see… as a group, people do predictable things as they age. And when you know what types of things people will buy… and when they’ll buy them in their lifetime… it’s almost like having a crystal ball that allows you to peer into the future of any economy. It’s predicting a massive real estate crash! I Know Something Most “Experts” Don’t! You see… economic bubbles are mass delusion, where investors wrongly assume that prices move in only one direction – UP! Nowhere is this delusion clearer than real estate. Almost without exception… the biggest economic crises in history have been led by massive speculation in real estate thanks to cheap credit from banks. Between 1980 and 1985, the U.S. dollar rose 50% against the Japanese yen… and American businesses weren’t happy about the flood of cheap imports from the Land of the Rising Sun. So, the 1985 Plaza Accord was passed to devalue the dollar and make U.S. exports more competitive… and Japan started to go into a recession. But the Japanese bureaucrats had a tried and tested formula that got Japan out of any rut experienced in the past half century… pump cheap credit into the economy. 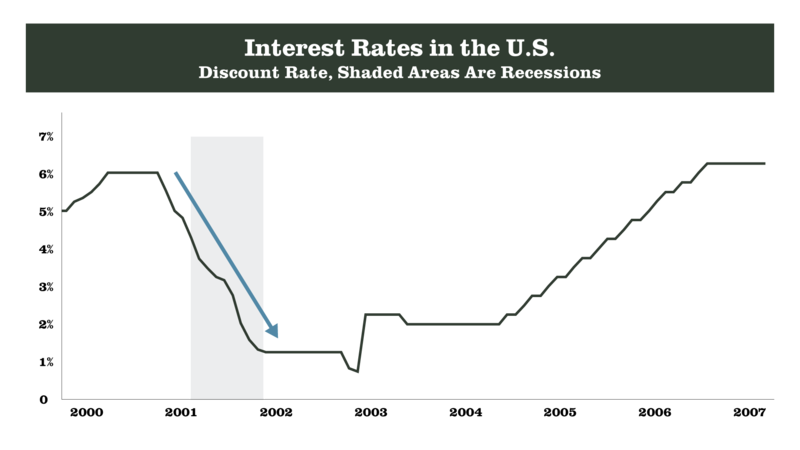 Interest rates plummeted from 5% in late 1985 to 2.5% in the first half of 1987. And once the Bank of Japan flooded the economy with easy money, it had to go somewhere –– domestic stocks and real estate. From 1985 to 1989, Japan’s Nikkei stock index tripled to 39,000 and accounted for more than a third of the world’s total market cap. Real estate prices in Tokyo’s prime neighborhood were suddenly worth 350 times more than comparable land in Manhattan, New York. The land underneath the Imperial Palace was rumored to be worth more than the entire state of California! Thanks to my demographic research –– and my extensive study on why economic bubbles boom and bust –– I knew Japan was sitting on a ticking time bomb. They simply didn’t have the population to continue to drive up real estate prices. 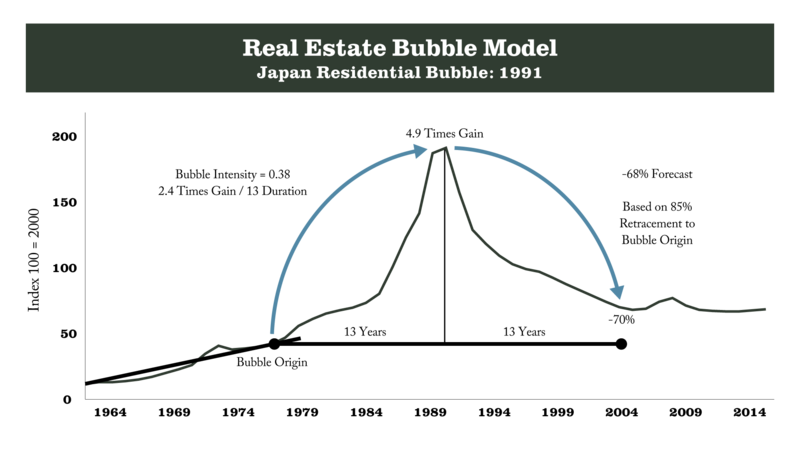 I knew for a fact that Japan was in a bubble…and I was publicly ridiculed by EVERYONE in the mainstream media for predicting their collapse. And then, in 1989, just a few months after I published my very first book, Our Power to Predict, in 1989… it all came crashing down. 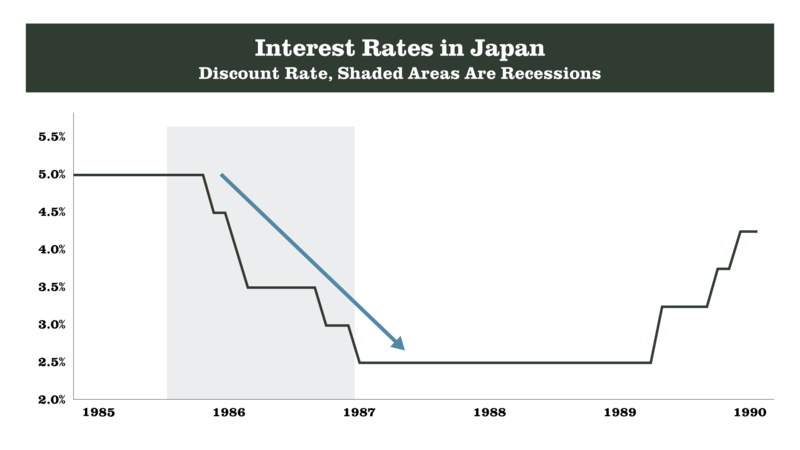 It’s been almost 30 years since the crash... and Japan can barely manage to prop up its deflating economy despite years of zero interest rates, repeated quantitative easing (i.e. “money printing”), and constant currency devaluations. But then in 2006… it did. But I first predicted it would happen all the way back in 1993 when I published my second book, The Great Boom Ahead... 12 years before the crash began! And just like Japan in the 80s... the U.S. was about to enter a decade-long real estate boom followed by a major recession. Then in 2000, the dot-com crash tanked the U.S. economy. And just like Japan did in 1985, the Federal Reserve used its favorite trick to try right the ship… pump cheap credit into the economy! 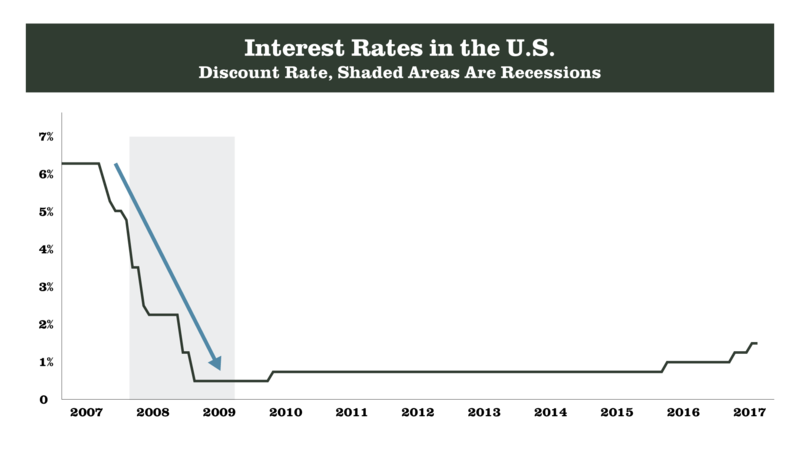 Interest rates fell from their December 2000 high of 6% all the way down 0.75% in December 2002. But most people had lost faith in the stock market after the dot-com bust. So where did all that free money go? Real estate! It was like watching Japan in the 1980s all over again… except this time, it was bigger. WAY bigger. Americans went hog wild and started buying property as fast as they could and created what was arguably the largest bubble in history. It was mass delusion at its ultimate height! It was the beginning of the worst economic crisis since the Great Depression. According to the Government Accountability Office… the Great Financial Crisis cost the U.S. economy more than $22 trillion. So, what did our central bankers decide to do to kickstart the economy? That’s right… pump even MORE cheap credit into the economy! But you MUST see through this fantasy if you want to have any hope of affording retirement! And when it pops, it’ll destroy the retirement dreams of millions of Americans in the process! How do I know this? Because all bubbles end when there are more sellers than buyers (and I’ll come back to this point in just a minute). 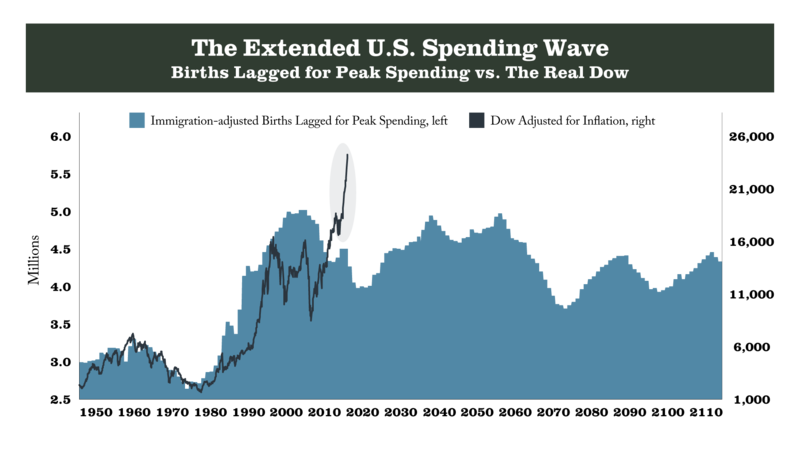 As I mentioned before… economies are driven by people spending money… NOT government policies or central bankers. Remember that crystal ball I mentioned earlier? Here’s what it looks like. 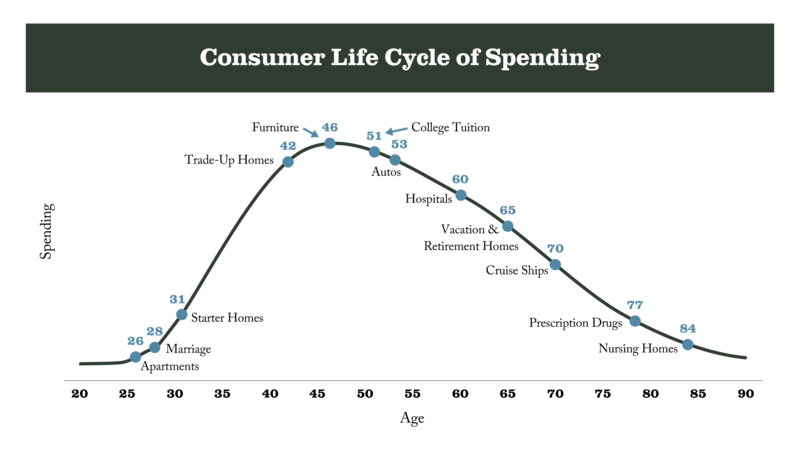 As individuals, our spending habits are quite different. But as a group, they’re shockingly similar. For example, we knew for the Baby Boomer generation that they’d buy their first homes at the average age of 31. Then, as they had kids and their families grew, they’d move into bigger homes at the average age of 41. And at around the age of 46, right as they’re getting ready to ship their children off to college, they’d hit their peak levels of spending… which is exactly the reason I was able to predict the 2006 housing crisis and the stock market crash with uncanny accuracy all the way back in 1993! All I had to do was add 46 years to the births we had in America (adjusted for immigration). A stunning correlation for nearly 50 years with the Dow Jones Industrial Average! But there’s simply no escaping America’s demographic destiny. That means the largest generational cohort in America is looking to sell their homes and cash out for retirement! As the Boomers start rushing for the exit all at once, that’s exactly what we're going to see. There are three MAJOR problems they aren’t telling you about that create massive risks for American homeowners. Right now, Millennials are the largest cohort of homebuyers in America. Which is exactly why the Boomers want to sell them! So what’s happening? Boomers and Millennials are competing for the SAME limited supply of desirable housing inventory. There isn’t a housing shortage. There’s a shortage of affordable housing in desirable areas. 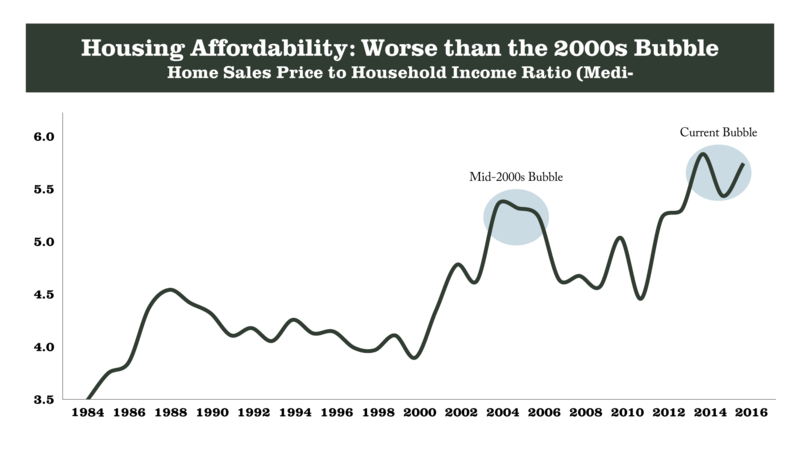 The reality is, homes have never been more unaffordable than they are right now. And despite all the cheerleading you see coming from mainstream media about the record low unemployment levels and how healthy the American economy is… nothing could be further from the truth. Because, guess who's been getting all those jobs? It’s not the Millennials or Gen Xers… it’s Boomers! Because Baby Boomers have delayed moving into retirement, they’ve also stayed in the workforce much longer than normal. And they’re often willing to take lower pay in exchange for a steady income to help them with the monthly bills and continue to save for retirement. 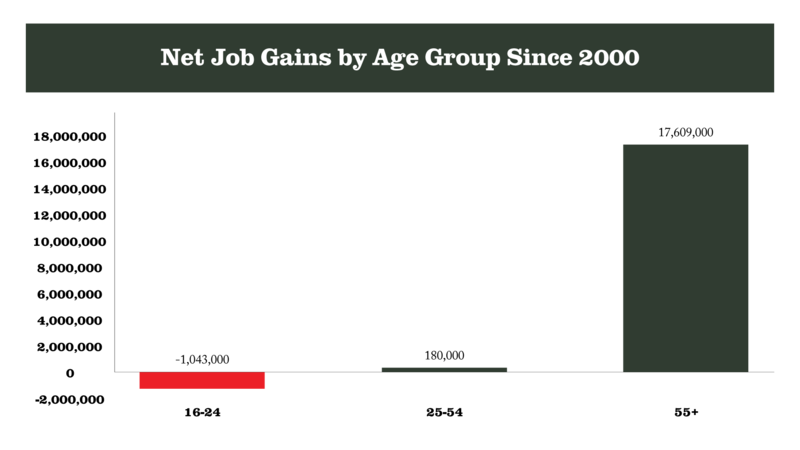 Which means not only are Boomers competing with younger homebuyers for the same inventory… but they’re also competing for the same jobs! So, who’s going to buy all those unaffordable homes at the prices Boomers expect to sell them for? 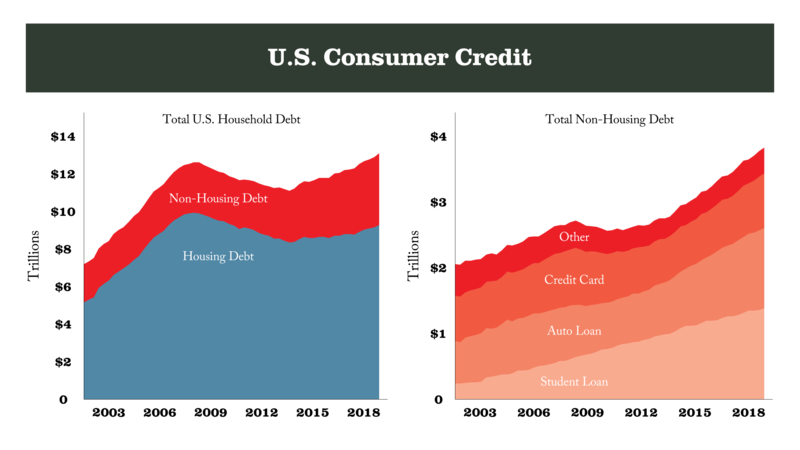 Nor the one in five American households that are currently flat broke or in debt. Tens of millions of American households across the country earn less income, have less wealth, and carry far more debt than they did in the 2000s! Meanwhile, banks are still stringent on mortgages, even after one of the most liberal lending periods in banking history. There’s still one major problem. Here’s the harsh reality about living: One day you’re gonna die… and in America that statistically happens at age 79. And as more and more older American homeowners start to die off, their empty homes will come on the market. 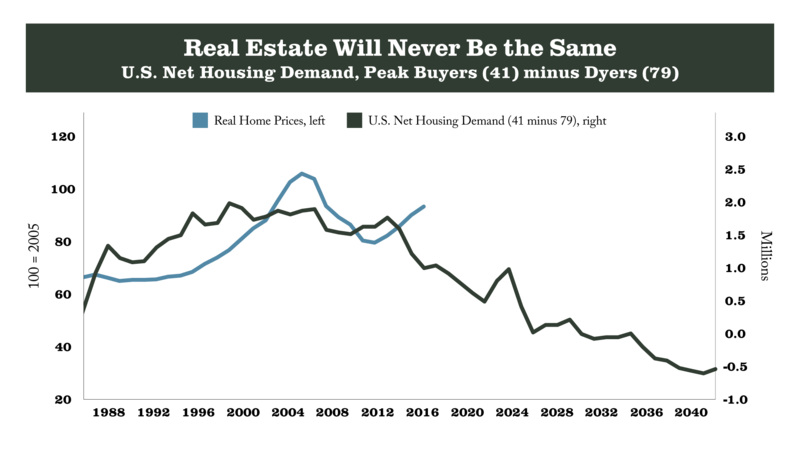 Which is why, when we make residential real estate forecasts here at Dent Research, we factor in the number of “dyers” to accurately predict total supply and demand. And when you add in this missing piece of the real estate market puzzle… there’s only one rational conclusion you can come to. Over the coming years and decades… there’s going to be WAY more supply than demand… and that, by definition, will drive prices down. And when the market starts forcing home prices down… no amount of cheap credit from the Federal Reserve will ever entice dead people to buy new homes and reflate the real estate market! I call this phenomenon the “Demographic Cliff”... and it’s exactly the reason why Japan’s real estate market has NEVER bounced back from its 1989 peak. There’s simply not enough people ALIVE in their country to buy all the available houses. And America –– along with several other wealthy, developed countries around the world –– are all headed for the same fate. There’s no escaping our demographic destiny! It’s Going to Take Everything Down with It! That’s why I’ve been working these past few months on a new eBook to help regular folks like you prepare for this upcoming crisis... and grow your wealth in the process! The eBook is called Real Estate Doomsday: How to Protect and Grow Your Wealth During the Greatest Real Estate Crash in History. The truth about big city real estate –– Most people believe property prices could NEVER fall in major markets like New York City… but history tells a different story. Here’s the truth your realtor doesn’t want you to find out [page 7]. What’s REALLY propping up property prices. You’ve probably been hearing about the housing “inventory shortage” driving the real estate markets these past few years… but here’s what the mainstream media ISN’T telling you (and it could cost you dearly) [page 9]. DEBUNKED! The Biggest Real Estate Myth Ever –– Every real estate investor alive wants to believe prices on whatever they own can’t go down. And it’s all because of this one dangerous lie… [page 6]. The “DVB” equation –– The most important formula every real estate investor MUST know: You’ll never hear about this from any so called real estate “gurus”... but armed with this one simple formula, you’ll instantly know which markets are healthy and which ones to avoid like the plague [page 16]. EXPOSED! The Fed’s “great delusion.” It’s the single biggest threat to our economy… and to YOUR wealth. Here’s how to stop it from robbing you and your family of everything you’ve worked so hard to save [page 2]. Why these 15 “super cities” are about to get slaughtered. Most people think the super-rich will always buy in these desirable areas, but history proves otherwise. Some of the ultra-wealthy will get out in time… but the truth is, they’re going to get hit the hardest. Make sure you don’t buy property in any of these 15 cities [page 30]! How much your home is REALLY worth (WARNING! This might upset you) –– Banking on your house to help you pay for retirement? If so, this “real value” real estate formula will tell you what your home is REALLY worth… and the answer will shock you [page 35]. PLUS! My “secret weapon” for accurately spotting bubbles. It’s taken me more than 30 years to develop this tool… and it’s how I forecast some of the worst financial crises of our time. What it says about where YOU live might surprise you [page 13]. I know this is a hard truth to accept… but it’s crucial to your wealth and wellbeing that you take this warning seriously and prepare now. Because there’s nothing Donald Trump or any of the bozos at the Fed can do to stop this catastrophe from happening. But if you take this warning seriously… you CAN do something to protect yourself and your loved ones from getting wiped out when it does. But the problems we’re facing here in America are only a tiny piece of a much larger and global revolution that’s about to take place. The massive political, social, and economic upheaval that’s likely to unfold in 2018 was practically preordained! It’s the culmination of more than 30 years of research into cycles and demographic trends. 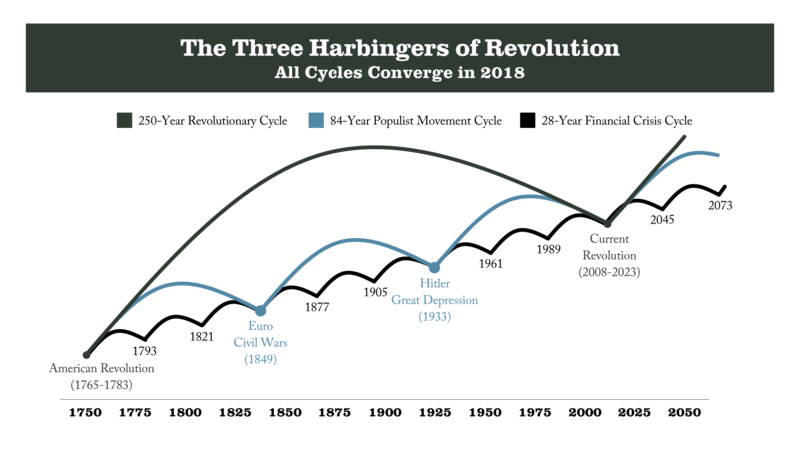 When you zoom out and chart all of history’s largest and most significant turning points… they ALL happen on a disturbingly predictable schedule! And Zero Hour –– an event that only happens once every 250 years –– is going to be the single most disruptive event we’ve seen since the American Revolution. It’s going to be a full-on rebellion against the power structures of the past… here in the U.S. and around the globe. You can put yourself in prime position to reap untold riches as Zero Hour unfolds! Born before 1958? Then the news on page 40 might upset you. But it’s essential to know if you want to cash in on what could be the wealth-building opportunity of a lifetime! This book retails on Amazon for around $19. Once you read through both the eBook and my latest bestselling book Zero Hour: Turn the Greatest Political and Financial Upheaval in Modern History to Your Advantage … I’m confident you’ll be a believer in the predictive power of demographics and economic cycles. Demographics allow us to see the “big picture” with uncanny accuracy… but they can’t possibly predict every short-term trend, market fluctuation, or absurd central bank policy like negative interest rates. That’s where my private investment research newsletter Boom & Bust comes in. Every single month, my team of analysts and researchers will regularly update you on the coming economic collapse... its impact on the stock markets... different investment sectors... commodities (including gold)... real estate... and emerging trends like bitcoin and blockchain. Over the past five years, we’ve delivered a 14% average return on our investment recommendations compared to the 10.65% average return of the S&P 500. When global commodity prices were crashing in 2014, geopolitical tensions were rising, and Ebola was front page news... we posted a 40% average winning gain when we closed several positions we recommended in 2012 and 2013. When the markets were trading sideways in 2015, our subscribers were cashing in on winners like 87% on OHI, 95% on AEC, and 59% on DOW. When 2016 opened with the worst three months in history… all but one of our open positions were up! We ended the year making an average of 13% on our closed positions. In 2017, our readers had a chance to cash in on gains of 37% on NLY, 16% on UUP, 25% on JFR and 19% on TBT… all BEFORE Trump came into office and sent the stock market on an upward tear. And so far this year… we’ve already closed out four double digit winners, with our top pick VALE hitting a nice 36% gain in just over four months' time! And I’d like to give you a risk-free trial to Boom & Bust so you can see for yourself the quality of research you can expect from the entire Dent Research team. Here’s what you’ll get with your risk-free trial to Boom & Bust, all BEFORE Trump came into office and sent the stock market on an upward tear. 12 monthly issues of Boom & Bust: Every month, you’ll receive an in-depth newsletter from me and the Dent Research team packed with our latest research and recommendations. Access to every single back issue: Not only will you be able to review this month’s issue of Boom & Bust… but you’ll have access to every single issue we’ve ever published over the past five years. The weekly 5-Day Forecast: Every Monday, Dent Research’s Chief Investment Strategist, Adam O’Dell, keeps you updated on what’s happening in the markets... and Boom & Bust model portfolio manager, Rodney Johnson, keeps track of the model portfolio, ensuring you can make the timely moves you need to. In short, my team and I will do everything we can to guide you safely through the looming economic crisis...and come out the other side much richer than you are today. Because at the end of the day... it’s the impact we make on the lives of honest, hardworking, everyday Americans just like you that keeps us in business. Look at what some folks have said online about my work…. “I run an investment management and financial planning firm and we use Harry Dent's research extensively. It is an important part of what we use in determining the economic outlook and how we should be looking at the world and how we decide to position our clients' portfolios. I think it is fair to say that Harry's insight has helped our clients significantly over the years. Here’s How to Get Started, 100% Risk-Free! That’s why I want to make this as much of a no-brainer as I can for you. A complimentary subscription to Dent Research’s daily e-letter Economy & Markets. Because we want to get this potentially lifesaving research into the hands of as many people as possible. We wish we could give it away for free… but even at this ridiculously affordable price of $79, we’re LOSING MONEY. You see… in our business, we only make money if we do our job and you decide to renew your subscription. But I’m confident that once you’ve had a chance to review the quality of our research... you’ll decide to stick around and become a part of the growing Dent Research family for life. And to make this even easier for you to say yes and start your risk-free trial offer… I’m going to give you the next 30 days to review the materials and see what you think. And if you decide to refund after 30 days, we’ll give you a refund on the unused portion of your subscription. The eBook as well as your hardcover copy of Zero Hour are yours to keep no matter what you decide. That means, when you take me up on this offer, you’re agreeing only to give me and my team a fair shot at your business. But I sincerely hope you take advantage of this risk-free offer and get the facts you need to do what’s right for you and your family. Or… you can take this warning seriously and have the once-in-a-lifetime opportunity to protect yourself –– and your loved ones –– from the devastating crisis at our doorstep. Remember: You won’t risk even a penny to check everything out! All you need to do to get started is click here.